The cavernous halls of Winterforge echo once more with the roar of fire and the ring of steel. Six legendary Guilds compete for the favour of the Royal Family, a favour that brings with it a prize of unrivaled value — the Royal Centenary Contract, guaranteed work for 100 years. 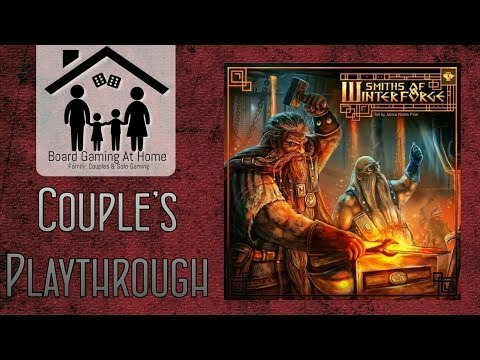 The Smiths of Winterforge will stop at nothing to claim this highest honour. Only one thing stands in their way… each other. Each Player manages one of the six mighty Guilds of Winterforge. Throughout the game, you will compete against your fellow Smiths to earn Reputation Points (RP) for your Guild. You gain these points by forging Contracts, employing a full Crew, upgrading your Skills, and paying off any Loans taken from the Bank. Be the first Guild to finish your Royal Contract and receive a helpful bonus.